Drawing on qualitative data gathered from public online discussions in which people account for their ideas about the iPad’s relevance, the paper addresses the question how the meanings of the device are constructed and negotiated. These discussions are motivated by the need to understand the new piece of technology and to grasp its legitimacy. The paper discusses these empirical findings within the framework of domestication of media technology. The meanings of different media and technology and their legitimate use are challenged and changed with the arrival of new technology. The data illustrate how people are negotiating the cultural place of the new device, and in iPad’s case, a design concept. iPad in particular is interesting because it defined a whole new category of technology design interfering with the traditional technological landscape. 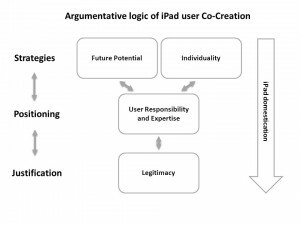 Two key discursive strategies are identified and a model of the iPad domestication process is presented in the article, which contributes to the studies of co-creation of technological artefacts by revealing the role of the users in finalizing the design and concept of the product. Apple introduced a new product called iPad in 2010. This “tablet computer” is a platform that can utilise the Internet as well as a host of other types of media and communication technologies. The device has a multitouch display and no traditional keypad. Its size and shape seem to place it between smartphones and laptop computers. The iPad, already in its fourth generation, has been a corporate success, aiming to define a whole new category of mobile devices. Many brands are now developing and marketing their own tablet computers in order to further solidify (and capitalize) this new category of devices. We chose to analyse the iPad domestication process due to the great number of users and the quick adoption of the device. Domestication of technology is a process in which the user has an active role in the outcome of the technology and in challenging the traditional notions of designer and user. The meanings of different media and technology and their legitimate uses are challenged and renegotiated with the arrival of new technology. Hence, the iPad does not enter everyday life in isolation but, rather, is “born” in a network of relations between, say, other e-readers, print media, desktop computers, television and the Internet. Such a disruptive, nomadic product category warrants scientific inquiry: in this article we chose to analyse iPad as it has in a short time become a known brand and thus has generated a lot of rich data in various online environments. The concept of domestication originates from anthropology and consumption studies and has been developed particularly by cultural media researchers interested in the role of information and communication technologies (ICTs) in the household (Haddon 2011, Morley and Silverstone 1990, Silverstone 1994, Silverstone and Hirsch 1992, Silverstone et al. 1991). Silverstone and Haddon (1996) present a model they call design/domestication interface to explicate how design and domestication form the two sides of the coin of innovation. This model is the starting point of this article. The model proposes that domestication is always anticipated in the design, and the design is completed only when people domesticate the design. Certainly, there are several economic, cultural, and political processes that constrain and enable the possibilities of users to define the meanings of a specific technology, but Silverstone and Haddon’s model highlights the activities of the users as agents who complete and rekindle the design. This act of collective creativity shared by two or more people has been referred to as co-creation (Sanders and Stappers 2008). Our article is a part of the developing field of design research which considers design as a social and interpretative practice and analyses how design concepts and ideas are produced in interaction (Danko et al. 2006, Ganoe 1999, Glock 2009, Luck 2009, McDonnell 2009, McDonnell 2011, Oak 2010). Our contribution is in elucidating the ways in which the users act as co-producers and “finalize” the design concept. The main point in our article is that domestication must also be studied as discursive practises focusing on the ways the devices are domesticated in and through language use and interaction. Here the focus is on the micro-level practise of language use: the analytical emphasis is on the linguistic strategies and cultural resources invoked in interaction. Such an approach resembles the methodology of discursive psychology: we identify speaker positions, praise and blame that is attributed to various actors and the premises for building an agency in the iPad related accounts. The focus is on scrutinizing these discursive strategies rather than trying to grasp some broader structures of meaning related to technology. This kind of a context bound, micro-level discursive aspect of domestication process has largely been neglected in domestication studies. A few recent exceptions include Maren Hartmann’s article on Wi-fi cafes where she analyses the context also as a discursive environment that is being shaped by media reactions (Hartmann 2009) and an article by Helle-Valle and Slettemeås (2008) which has developed a point of view emphasizing that domestication perspective should pay more attention to how technologies fit and are fitted to language-games that are an integral part of domesticating technologies (Helle-Valle & Slettemeås 2008). In addition Livio & Weinblatt (2007) suggest that when the focus is on investigating the domestication of technologies analysing the related discursive practises should not be considered less relevant than analysing the related actions, routines and rituals. This article deals with the iPad domestication process through examining naturally occurring online discussions (April 2010 until April 2012) related to the device. It takes into account the discursive work through which people position themselves and the device as they talk about the uses of the iPad. Identifying justifications for purchasing and using the device is of key importance in our study: these justifications reveal the culturally shared and acceptable ways of domesticating such a device. The users may speak from various positions such as a “techno-geek”, a book lover, a businessman or a woman, a parent, and so forth. Various positions afford different critiques and possibilities to endorse the new technology. Hence, it is important to see what kinds of positions the iPad activates and to which effect; not only is the iPad given various roles and objectives but the users also are being shaped and placed into various contexts. We consider every discussion about technology as a mini-intervention to the culturally available resources that can be invoked in order to make sense about one’s uses of technology. Domestication of technologies involves various things that people do and say just to show to other users that they are active agents who participate in completing the innovation and design as noted by Silverstone and Haddon (1996). However, this aspect of domestication has not been empirically studied to a great extent. This article elucidates the kinds of questions and approach to data that enable the analysis of this day-to-day co-creation. The users comment on the device, defining and discovering the boundaries of the attractive and legitimate uses, thus completing the design in the process of domestication as co-creators of the device (Bakardjieva 2005, Katz and Sugiyama 2005, Lie and Sørensen 1996). This article explores how the iPad is being domesticated via discursive efforts. It will identify the key discursive strategies through which the innovation is recognised and then made sense of. The paper is organised as follows. Domestication studies as well as data and methodology are discussed in their respective chapters. Empirical analysis is then presented with subsections on 1) the discursive production of future potential and expertise concerning the iPad and 2) articulation of the individual uses and the collective comprehension of the design concept. Finally, the conclusions are presented. Whether and why a technological device or service does or does not become popular is not an easy question to answer. Donald A. Norman provides thoughts about the “success” of technology products in his book The Invisible Computer (Norman 1999). Norman set out to understand the ways in which technology is adopted and why it is that some products are successful while others fail regardless of how “good” they might be. He was particularly interested in the personal computer and how it has fared on its way to becoming a mundane household commodity. He notes that every technology has a life cycle and as they “progress from birth, through troubled adolescence, and on to maturity, their characteristics change” (Norman 1999). Such transformations in the way we understand a certain technology can likewise be studied. Research on the ways in which technologies become a part of the everyday life does not have a long tradition yet (Lie & Sørensen 1996, 2). It is true, following Norman’s thinking, that as technologies age and mature, their characteristics change – as technologies become commonplace, people become increasingly familiar with their presence and various routines and habits develop. As technologies are adapted they are both shaped and shaping as they form a multiplicity of relationships in the culture, manifested in the practices of individuals and institutions (Silverstone et al. 1992). The users of technology likewise change; technology in use can be understood in multiple ways as people accumulate experiences with it and share them in social interaction. It follows that products of technology can change everyday practices but a product such as an iPad is never adopted as such – people never use it quite the same way the designer intended it to be used (Lie and Sørensen 1996, 8–10). Usually people refuse to use some of the product’s features, which the designer views as sophisticated, or they find innovative ways to use it differently, perhaps in a thoroughly unexpected manner. Products, then, are socially shaped but we must also remember that the “social” is itself shaped by the products. In domestication studies it is emphasised that adopting a technology is a process rather than a single event. Using and consuming various products is, in itself, a production of meanings and culture instead of just mirroring the meanings and significance already inscribed into products and technologies. (Haddon 2003, Haddon 2007). Domestication can also be seen in connection with cultural media studies where e.g. television has been studied as part of social practices and family relations (Peteri 2006). According to Peteri the idea of domestication might suggest that technologies are domesticated once, after which they simply exist, resisting change over time. However, the role of technologies, for example in the context of home, is constantly evolving, and even familiar technologies may assume new characteristics. Thus, Peteri (2006) notes that domestication is not a process with a clear-cut beginning and end. This is easy to understand, particularly in the case of information and communication technology such as the iPad, which has multiple uses and is connected to various spheres of social interaction. Furthermore, it is also connected to virtually all “traditional” forms of media, such as newspapers, television and radio. Domestication has to do with concrete artefacts, devices and practices that enable negotiations regarding home, family and everyday life (Jokinen 2005). Furthermore, through their uses they contribute to our understanding of private and public, gendered division of labour and work, family and private life. According to Lie & Sørensen (1996, 3) the routines and functions of everyday life signify stability and reproduction of social patterns. They note that introducing technology into this context necessitates a review of the notions of both everyday life and technology: everyday life is not so stable and technology is not so revolutionary after all. New technology such as the iPad may provide a stimulus for change but it may also serve to further consolidate the routinised actions of everyday living. Katz & Sugiyama (2005, 79) refer to consumers of technology as “co-creators” in their analysis of users innovating novel ways to use their mobile phones. As Lie & Sørensen point out, consumption of technology leaves considerable room for action at the user’s end instead of making the user adapt to whatever properties technology may have. Bakardjieva (2005, 25–26) too notes that the term consumption could be replaced with the term use as it “subsumes consumption of both technology and content, but it also encompasses a wide set of significant practices that remain invisible from the perspective of the standard production-consumption dualism”. A key point is that in the introduction of technology into people’s lives, the categories of the designer and the user need to be understood and explored in broader terms than rigid a priori facts. Studying the role of technology in everyday life reveals how human actions shape socio-technical relations and how people make technology meaningful in their lives. Instead of studying the “impact” the focus shifts to understanding the innovation occurring after the technology leaves the drawing board. This is a central idea in the constructionist turn of technology studies roughly since the late 1980’s. Thus, “taming” new technologies, domesticating them and their capabilities is seen as a process in which the user, the consumer of technologies, has an active role that contributes to the outcome and the role of technologies in the context of everyday life, thus challenging the traditional conceptions of designer and user. (Lie & Sørensen 1996, 4–9). This latitude for user innovation proved a core element in the discursive strategies presented in this paper. As members of the society, people have internalised various shared understandings concerning technology. It is necessary to the way in which people function, as it is not possible to always reflect in detail everything we come across as a part of daily life (Alasuutari 2004, Heller 1984, Tannen 1979). Rather, people have a cultural understanding about perceptibly normal actions, such as shopping in a grocery store or having a phone conversation. Deviation from this normative order is subject to social sanctions (Garfinkel 1967). Hence, people have expectations regarding the events that the mundane practise of everyday life consists of. The only way people can make sense of the world is to see the connections between things, experiences and past events (Tannen 1979). As soon as people encounter new things, they also begin dealing with expectations. As people account for these things and events, they also construct frames of expectations that they may find adequate or deviate from. Through the analysis of the data we contribute to the understanding (Alasuutari, Luomanen and Peteri forthcoming) of the ways in which people relate to the new situation: what conceptual resources they use to make sense of them, and whether they consider a form of action justifiable or morally problematic. Thus the analysis will shed more light on what forms people’s iPad use is likely to assume and why, because the meanings associated with the action tell us about its motives and about the ways in which iPad user identities are attached to it. The data was obtained by means of sampling naturally occurring online discussions pertaining to the topic. These data have been found simply by doing Internet searches using iPad as a keyword. The data are not restricted to a certain country or region but, rather, international discussion forums have been utilised. The data gathered represents the time right after the device was announced and until people started getting their own iPads and gaining experience with it. This time span is from April 2010 until april 2012. Although domestication is a continuous process, in the beginning the device is particularly visible and “untamed”. Hence, such a new product produces a lot of talk where it is negotiated and defined as a part of everyday life and culture. In the beginning of the analysis both authors searched for discussions, blog posts and forums about the iPad. On the Internet there is a great abundance of such data: literally thousands if not tens or hundreds of thousands of comments have been made. We printed out a large number of discussions that we could find and then took our notes and findings together to see whether we had found any similar discursive practices. In the end we sampled 15 forums and 20 blogs for data. The length of the printouts per a blog or a discussion thread varied from a few pages to 120 pages. We did not search for forums or blogs dedicated to the iPad only, but sites of broader interest, usually created around a hobby or some other type of activity (e.g. photography, cycling, TV, literature). These people were then commenting on the iPad spontaneously as they had found it worth writing about. As such, it is a good example of a technology arriving into peoples’ lives, creating controversy and need to discuss its characteristics. In this article we focus on the ways of building legitimacy for the device and the user against criticism. The samples presented in this article illustrate how the legitimacy is achieved – therefore the criticism against the device is always present as a kind of a subtext. After all, in case there were no critical attitudes towards the device no-one would bother discussing the legitimacy of the device. It is not simply a setting where there are either critical people or enthusiasts. Rather, even people who find the device mostly appealing also recognize the critical arguments and not only need to convince others but also themselves before committing to a purchase decision. No directly individually recognizable information is published, and possible names and nicknames have been changed in order to preserve anonymity as well as possible. This is why we omit the names of the blogs and forums. On the other hand, the discussions have been posted in public domain and the topic is not particularly sensitive. Due to the restrictions in the length of the article we could not include long strings of discussion but rather we analyse individual comments. However, we did include three samples from a single discussion thread (extracts 1, 2 and 6) to give an example of the way in which people respond to a post in an online discussion. Social constructionist approach to understanding the data is adopted, and discourse analysis used as the method. In discourse analysis it is maintained that a self-sustaining and coherent self or an identity is an illusion, since people continuously construct their identities in social interaction with various repertoires which, depending on the context, might be contradictory with each other (Alasuutari 2004, Burr 2003, Jokinen et al. 1999, Potter and Wetherell 1987, Suoninen 1992). In this respect, language use is directly linked with the construction of the identity as it affords individuals with various subject positions (Alasuutari 2004, Davies and Harré 1990). The positions are not necessarily non-contradictory, but fragments in the discursive production of personhood (Davies and Harré 1990). Due to the nature of the data we cannot know who the commentators are and what kinds of motivations they may have. Within our methodological approach there is no need to guess what people “really” think (or in the case of the online data, who the people really are) as the data studied in this article explicitly presents the variety of ways it is possible to talk about technology. Rather than trying to categorise people, the analytic emphasis is on elucidating the ways it is sensible to account for the uses and roles of the iPad, what premises these accounts are based on, and what sort of positions are accomplished and given to the device and also other users. Hence, even if a person initially criticizes the iPad and later confesses a liking for it or finds it very important, the researcher need not wonder whether this person should be put into the slot of iPad “haters” or “enthusiastic users”. The focus is not on the individual but on the cultural (Alasuutari 2004; Burr 1995; Luomanen 2010; Potter 1996). In our article domestication as a concept does not refer to home or to domestic environments but rather to appropriation and taming of the new device via culturally available discursive means. In the case of our data the “cultural” does not refer to home cultures or national cultures (although we acknowledge the data has been collected from English language forums). In a similar vein as Helle-Valle & Slettemeås (2008) we see this as a pragmatic and analytical decision. It enables us to use data that is not restricted to domestic environments or to certain nations and also to emphasize the meaning of “domestication” as a discursive adoption of and taming the device. The data include not only isolated descriptions of the new device but, rather, discursive work that contributes to and produces the new device. After all a new product is not an innovation unless it is recognized as one. As such an innovation is offered to people there need to be justifications for its existence. A technological artefact does not really stand a chance of success without layers of discursive sense making about the reasons why such a device should have a place in the lives of people. Based on the analysis of the data this task is carried out through two distinct discursive strategies. The first strategy of defining the iPad as a distinct innovation as well as a worthy product is to place its true potential into the future. As it is developing and a “revolutionary” product, not all of its capabilities can yet be known. Thus, within the argumentative logic of the accounts it cannot be legitimately criticized due to this future potential. Second, as every iPad and every user are accounted as individuals, the users’ experience cannot be questioned. Here the argumentative logic builds on the fact that the customization possibilities and individual uses are practically endless, thus making every iPad and every user individual. Therefore, the legitimacy of the device or the uses cannot be challenged. These are the two key strategies of countering iPad criticism and gaining legitimacy as a user. These strategies are overlapping and thus impossible to explore in total isolation from each other. In the following section we analyse how the iPad’s potential is placed into the future and how the user expertise is accounted about in relation to that. After that we illustrate how the individuality of the uses positions it beyond critiques and how people account about themselves as co-creators of technology. The more detailed reviews seem to be pretty clear that that it easily beats out most existing netbooks, but can’t quite compete with laptops (for power) or smartphones (for communication). Most of the reviewers agree that it’s great for viewing videos, photos, and browsing the web. It makes an okay (but not great) e-reader. Otherwise, the first generation of apps has done a really good job of taking advantage of the screen real estate. This and the following extract are responses to a query about user experiences of the newly released iPad. The original query was about getting a true user’s perspective instead of more “blue sky talk” and “hype or advertising fluff”. In this reply the characteristics of the device are weighed against its competitors in order to make sense of it. In the technological ecosystem where various gadgets are available any device must prove to be worthy in order to present a viable option to consumers: it would be silly to buy an inferior product. Since the iPad can do so many things, it is being compared to a wide range of competing products. The argumentative logic in the above sample is derived from two positions that are given to people who discuss and evaluate the device. First, many people are accounted as trying to figure the iPad out: they are not yet insightful. On the other hand, there are the “reviewers”; advanced users that have gained a deep insight concerning the device. The speaker position is not explicitly made but the account leaves latitude for an interpretation that the speaker is also an expert. After all, he paraphrases the experts, and more importantly, he has recognized these groups. The expert talk about the iPad also includes the apps, the software programs that utilise the capabilities of the device (such as the GPS, the processing power, the large screen). The apps are referred to as belonging to the first generation, which produces an understanding that here we actually have a device that will continue to develop through the refinement of apps. The fact that a reference is made to app generations further solidifies the speaker’s position as an expert. As a result, the iPad is constructed as a device that not only has great potential but also requires certain abilities from the user so as to be able to fully comprehend the whole technological entity that the iPad is. Consequently, the device is not only domesticated “as is” but, rather, as a future potential yet to be unleashed. The above sample also invokes the concept of developing software as an integral part of the iPad. The following sample (a response to same original query as extract 1) further illustrates this point. It’s only been out a few weeks so new software is eking out. People like the above poster who rails against the iPad will likely find iPad clones to be just that, clones with worse support and less available software, the software needs to be different to take advantage of the simple interface. It is not a replacement for a computer, it is a new type of device its potential is yet to be discovered. The best is yet to come. Here, a group of people are identified as railing against the device because they have failed to learn enough about the concept. The argumentative currency is derived from a distinction between the refined design and software of the iPad against the poorly executed implementations in the competing devices; the clones. As these competing products are referred to as clones, it is implicated that the iPad is the original, authentic product. The iPad is constructed as already being a superior product in comparison to the clones, but also as a product that is still evolving at a great pace. The clones are described as being stagnant, cast in stone, failures. Importantly, the iPad is accounted for as setting a task for the users: “the potential is yet to be discovered”. It is the users who must, together with app developers, realize what can be done and what new uses and rewards are to be found. It is like an invitation to adventure. The argument is constructed around the claim that iPad is so new that we cannot yet criticize it as the potential is still in the future. As the innovativeness of the device is emphasized, it follows that the device is “untouchable” by other categories of technologies, since the users cannot yet define the boundaries for the abilities of the iPad. iPad is aimed as a ’content’ consumption device, a device which could potentially replace a full PC in many households, a device which will challenge the laptop for certain knowledge workers (including this one), a travelling entertainment device, something to amuse the kids on long journeys, a digital picture frame, a portable email client, a web browser sans compare. By referring to the aim of the designer without any hesitation the argument gains authority. The “content consumption device” is a recurring notion in the accounts where the iPad is depicted as a revolutionary novelty. In a way, he translates the design goals to fellow users and to those who do not yet comprehend the technology. Again, the full potential of the device is accounted for as existing in the future as more people come to grips with its abilities. Various iPad use cases are identified and users such as “knowledge workers” are mentioned. Many of the described uses take place in movement; these users are active and able to tailor the iPad to suit their needs, in a way to facilitate their active lifestyles and demanding careers. Based on the data, the domestication of the iPad is largely about defining it as a representative of a new genre. Likewise, it is accounted for as a device that is somewhat elusive: it must be seen as an existing product as well as one that is soon-to-be due to its enormous potential. Furthermore, an integral part of the domestication project is the effort to define the users of the device, their abilities, and characteristics. The mainstream of these accounts depicts these people as active users who want a device that facilitates their work and leisure in equal measures. Not necessarily “nerds” but people who get the rewarding user experience through the seamless amalgamation of contents and a smooth platform rather than from dwelling with endless technical intricacies for the sole purpose of being able to master them. Consider the sample below as an example. There’s been so much hype about this device, so many previews, and shared online experiences, that when I finally unboxed and activated mine, it was almost as if it was something I’d had for years. It felt surprisingly comfortable and familiar. There are definitely things that it could do better. But, for now, I’m having a lot of fun exploring it and how it will fit into my life. My biggest surprise is that it wasn’t at all disappointing. So often when I get a new device it somehow doesn’t live up to expectations. It’s too slow, or it doesn’t work the way I thought it would. The iPad works exactly as I expected — which, in itself, is surprising. And, in fact, it’s even faster than I expected! There are several distinctions made in this sample. First, the speaker addresses the amount of iPad related talk online. Due to this he has been able to evaluate the device together with other people: the co-creation of the device has begun prior to actually getting it. He differentiates between hype and more substantial contributions such as previews and actual user experiences. To further consolidate his position as an educated consumer (as opposed to someone who buys into the hype) he describes the iPad as not being perfect but having some things it could do better. After this, he is able to praise the device without appearing to be a “fanboy”. The device is constructed as something that has to be fitted into one’s own life without necessarily knowing what roles the technology can actually take. This process is described as fun, motivated by the fact that one can facilitate his or her interests on a very personal level. By implication, new technology normally is cumbersome and awkward to use. The fact that the iPad was not disappointing is against the norm; people expect the technology to fail expectations. This is a good example of building a frame of expectation (Tannen 1979, Tannen 1993) and then utilising it as a resource of illustrating how the experience of using the device deviated from this frame. This creates a dramatic departure from the frame of expectation and is narratively efficient: the uniqueness of the device is emphasised. The comment “The iPad works exactly as I expected” not only constructs the device but the user as well: he was able to accurately anticipate the user experience, thus positioning him as an expert. The extract has many conflicting elements such as surprising and expected features, being able to anticipate the device accurately and yet be surprised by it. In a way he was not surprised and yet surprised at the same time. Through the elegant discursive management of these elements an account is created where the device and the user match each other perfectly. Through this work expertise is assigned both to the device and the user. The fact that the device was not deemed disappointing contributes to the mainstream effort to place the iPad in a category of its own. Even though the device is constructed as something ground breaking, there still are users who have been able to anticipate it. Thus, these users emerge as highly competent and a good match to the device, almost in a category of their own as well. In this chapter we further elaborate the discursive work that is geared towards managing the legitimacy of the accounts. When producing descriptions about various issues and objects, people may assume various positions such as an expert, enthusiast, novice, and so forth. As users of technology, people can accomplish various positions that can, for example, gain them legitimacy. On the other hand, some positions can be uninviting and thus rejected as is illustrated in the next sample. I am not an Apple fanboy”, I don’t possess any Apple devices thus far, not even an Iphone. But I have to admit this device has me drooling. All the negativity about what the Ipad can’t do, is centered around the fact it’s being compared to a laptop. Those who have watched Steve Jobs’ keynote speech will know that this was not the intention. The Ipad was intended to fill the (most definite) void between laptops and smartphones that has certainly not been filled by netbooks. People can’t make a mistake in their perception of a product. They’re the ones to buy it, they’re the ones to review it, and they’re the ones to use it. The commentator refuses the position of a “fanboy” in order to ward off any accusations of being overly biased towards Apple products. To solidify this, he states that he has no Apple products of his own, thus rendering him an objective reviewer. As a result of this positioning work he gains legitimacy when he says that this device has him drooling. As opposed to the fanboys, the speaker also accounts for the critics who fail to appreciate the device due to their misplaced comparisons with laptops. The logic of the argument in this sample is that both these groups share an overly emotional approach to the device. Hence, the speaker accomplishes a legitimate position as a rational observer. The reference to the keynote delivered by Steve Jobs serves to emphasise that he is not alone in his opinion, the very manufacturer of the device agrees with him. As he accounts for the users as being incapable of being wrong about their own judgement, it is seemingly in conflict with his earlier description about the people who have misplaced critiques about the device. Hence, this inability to be wrong in one’s opinion refers to the people who find value in the iPad. This is likely based on the notion that people must find their own ways of making most of the device: “They’re the ones to buy it, they’re the ones to review it, and they’re the ones to use it”. To warrant a review the iPad emerges as a special kind of device–it must be learned about, worked with, and fitted to suit one’s needs and desires. In a nutshell: if you have a use for it, you cannot be wrong. In that case the device cannot be a mere status symbol or a passing fad, but rather, a legitimate tool for whatever it is that people use it with. It is the individuality that cannot be questioned. In the following sample (from the same discussion thread and a response to the original query as were the extracts 1 and 2) another example of this is given. No two iPads are alike or used the same by its owners; therefore, it’s a bit foolish (as we are seeing all the time in online forums and elsewhere) to try to determine how one will like/use or not use an iPad, from how others use or not use one. The whole purpose of an iPad, is to select the type app./apps. you need for your enjoyment/work/travel/hobbies or other needs. One neighbor of mine, has hers full of all sorts of cook books/recipes, designed specifically for use on the iPad, gardening and culinary herbs apps., free video-podcasts she subscribes to on wine, and she’s now a very happy camper. Since the customization possibilities and individual uses are practically endless, every iPad and every user emerge as highly unique and authentic. Hence, it would be hard to argue that the uses were not legitimate as they gain their meaning from the personal experiences of every individual user. This reply rejects the idea that anyone could tell what the “real uses” of the iPad are, thus challenging the logic of the original query. An example is given about a woman who has found many gratifying everyday uses for her iPad. Recipes, gardening and podcasts on wine are in a sense quite far away from the activities of a techno-geek, which give legitimacy to the uses: the device has not been bought simply because it is an Apple and cool to own as an artefact. A woman who is into cooking, gardening and quality wines is a person with clearly authentic interests. Hence, it is a brilliant example of a user whose iPad use is hard to criticize. It lends support to the original claim that iPad use is always highly individual. The above sample is a response to a person who wanted people to tell him what the iPad is good for. The person making the question emphasized that he did not want to hear more hype and advertising “fluff”. The response in a way rejects the idea that anyone could tell another what it would be like. Instead; the responder opines; everyone tailors the device to suit their needs. Had he talked about his own uses enthusiastically, he may have set himself up for criticism. Using the neighbour as an example wards off any suspicion of hyping the product. Wine hobby can be seen as a cultured pastime activity. It is probably not a coincidence that it is mentioned in this context as it effectively produces the person as someone who does not fall into the stereotypical image of a young techno geek. Similarly, books represent another traditionally appreciated form of culture. In the next sample books and iPads are discussed. I hope it didn’t come off as too arrogant. I’m trying to help us define in clear and rational language what kind of physical books will survive this digital transition. If you want to make cheap paperbacks — by all means do so. I just don’t think anyone will buy them. The rest of us will be reading those on our iPads and Kindles. So instead of creating this romantic delusion about saving all forms of printed matter, I hope to energize us book lovers around the forms that *do* have worth as objects in the context of digital publishing. The landscape of books (newspapers, magazines, etc) is changing. Our energy should go into supporting narrative forms that have futures. The commentator seeks to motivate his fellow book lovers to appreciate the changing landscape of printed products. He positions his “fellow booklovers” as active agents who have the power to define and promote the kinds of future they wish to see. To balance this account, the commentator refers to a “romantic delusion”, thus positioning himself as a person who is open to technological development instead of being a Luddite. Hence, this account displays competence in both the worlds of technology and literature. In this sample a contrast between two approaches is created: an emotional romantic approach and a rational, forward looking one. The speaker positions himself in the latter group from where he addresses others “in a clear and rational language” and sets up a task to collectively define the current and future states of literature. The iPad is constructed as a disruptive technology that has dramatic implications on the print media. In his view, in the age of the e-reader some print media may be rendered unnecessary as material objects. This, of course, is a concern for the “book lovers”. In particular, this sample illustrates how users define themselves as “us”, the co-creators of the new media landscape. They recognize themselves, both individually and collectively, as being able to contribute to and define the ways in which the iPad and iPad use could evolve. Clearly, the above account is motivated by the assumption that consumers do have a say in the way things will progress in the future. According to the data, this kind of an awareness of being an agent in the change is typical. The sense of collective ownership is further illustrated in the following sample. I have to say, though, that while I did wonder about the uses to which my iPad might be applied, these days, I can’t imagine life without one. Like the soles of those oven-shaped carbon shoes that mould to the contours of your feet, the iPad ingratiates itself into the intimate eccentricities and peculiarities of each of us who fall into Apple’s marketing plans. This is probably the most individualistically adaptable piece of technology of all time. Non-iPad users are a black iPad-shaped hole waiting for revelation to fill the gap! Almost every day we iPad users find a new application through which to tighten the knot that now ties this machine to the contours of our lives. If this sounds like the impact of a bad drug habit, you are probably not far off course. Describing his apprehension of the uses of the iPad, the speaker rejects the notion of him being an aficionado or a braggart who only seeks the latest and greatest gadget. He compares the iPad to his hi-tech custom moulded cycling shoes that fit him perfectly. In this account, the iPad emerges as a specialized, highly customizable device that can cater to the specialized need of an expert. A reference to Apple’s marketing plans is geared towards underlining the speaker’s awareness of the iPad as a commercial product that is supposedly profitable, with marketing strategies trying their best to shape the expectations of users. Falling into this trap could be interpreted as a sign of a gullible consumer, but the speaker wards off this notion through this discursive work. Alternatively, he may see himself as belonging to a target group defined by Apple: a person who can utilise and appreciate such a specialized piece of gear, just like his beloved hi-tech shoes. Either way, the reference to the marketing plan positions him as a person who is aware of his consumer status while still being an active agent in the co-creation process. Verbally talented, the speaker cleverly invokes strong culturally available resources marriage and drug habit in order to come up with an ironic account about the near-addiction that the iPad causes. iPad use is described as marriage that only deepens and becomes more and more a part of our daily existence as time passes. The concept of drug habit is brought up so as to position himself as a person who is aware that it is not culturally acceptable to be too enthusiastic about technological gadgetry. In a sense, by “admitting” the addiction, he turns his account upside down and separates himself from the notion of techno addiction. As a result, he emerges as a person who has a good command over the culturally shared values concerning technology use and self-governance. By saying “We iPad users” the speaker also positions himself as a part of a collective user base where people have a similar user experience. The non-users are also described as shaped by the device as they are mere “iPad shaped holes”, a reference to Sartre’s idea of people having a God shaped hole in their soul, people who have not yet had the revelation that will inevitably lead to getting one. The iPad is described as a perfectly individual customizable device, and that precisely makes it inviting to large masses of people. This account strikes a delicate balance between the iPad as a highly individual device and yet a phenomenon that unites people, the “we” that have tied the knot and are happy in it. In this article we have examined how the iPad is being discursively produced in the data. We have examined what conceptual resources people use to make sense of the iPad and whether they consider its characteristics legitimate or debatable. Thus the analysis sheds light on the forms people’s iPad use is likely to assume and why. As such, it gives us clues about the motivations behind the decision to purchase and the use of the device as well as the justifications related to them. In order to appear competent, a consumer needs to gain a good command over the shared ideas of the legitimate uses of the device, lacking which he or she is subject to criticism for being an overly enthusiastic techno geek or a gullible consumer. Through these data we have drawn a discursive understanding of the ways in which people relate to the new device. This understanding contributes to the knowledge of technology design, co-creation, and domestication. Consider the following figure where the key components of the argumentative logic of the iPad domestication process are laid out. Figure 1. 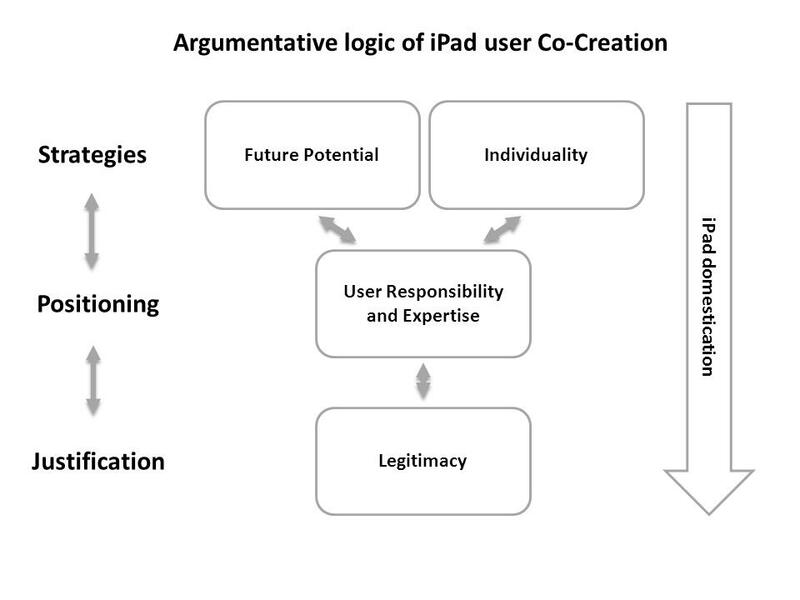 Argumentative logic of iPad user Co-Creation. The first discursive strategy of defining the iPad as a distinct innovation is to place its true potential into the future. Being a developing and “revolutionary” product, not all of its capabilities can yet be known. Within the argumentative logic of the accounts it cannot be criticized due to this future potential. Second, as every iPad and every user are accounted as individuals, the users’ experience cannot be questioned. These strategies at the same time demand and produce user responsibility and expertise. First, unless there is an expert who recognizes innovation and its future potential and/or individual possibilities, these strategies cannot be constructed and utilised in the first place. Second, these strategies ultimately produce the user who is unique and authentic in his or her demands. The future potential of the device also transforms the user into a dynamic, ever forward-striving individual with the competence to realize this potential. Both these strategies produce the iPad as a tabula rasa: until the user defines its significance as a part of everyday life it remains but a piece of hardware with great potential. Hence, it is the user responsibility and expertise that are at the core of the argumentative logic of the iPad domestication process. In the data the iPad emerges as a very “individual” product and yet it is discussed between people and defined collectively. Users are faced with a challenge as the device by default is extremely individual and customizable, thus constructing the user who is unique, representing no one but him or herself. Yet, the domestication process requires a shared understanding of the device. The discussions can then be seen as a balancing act between describing unique and individual uses and still retain a shared understanding of the device. One must describe ways in which the device can be used while maintaining that there really is no way to tell anyone how to use the iPad. People do and say various things just to show other users that they are active agents who participate in domestication of a device and in completing its design (Silverstone and Haddon 1996). In this article we have elucidated how the design/domestication interface is activated as people negotiate various aspects of the design. In case of the iPad, the discursive strategies outlined above are integral in finalising the design. Based on the data, due to iPad’s presence in the technology landscape, people have begun to describe more traditional media and devices as somewhat restricted in their nature: they lack mobility, usability, variety of contents, or customizability. Should this discourse become hegemonised, it will threaten and challenge the other media and devices based on their “stagnant” and “restricted” nature. Many technology firms have learned the value of high self-efficacy of customers. Consider Apple, which ships iPads without user instruction manuals, assuming that motivated consumers will possess sufficiently high self-efficacy to persist in learning to use the technology. Apple expects that skill requirements needed to co-produce the iPad experience are within its customers’ grasp. There are a great number of examples in the data where people reflect their action against manufacturer’s perceived design goals, all the while maintaining a status of an expert user. “We, the iPad users”, then, is not isolated from “they, the producers” but, rather, collective production takes place in and through the mundane uses and related user innovations. In the data there are also samples where a collective task of co-creation is set for the “we” whose actions can actually shape the future. Alasuutari, Pertti. 2004. Social Theory and Human Reality. London: Sage. Alasuutari, Pertti, Jari Luomanen, and Virve Peteri. forthcoming. Hobbies and Vices: Discursive Management of the Digital Media Environment.” Television and New Media. Bakardjieva, Maria. 2005. Internet Society: The Internet in Everyday Life. London: Sage. Burr, Vivien. 2003. Social Constructionism. 2nd ed. ed. London: Routledge. Danko, Sheila, Jason Meneely, and Margaret Portillo. 2006. Humanizing Design through Narrative Inquiry.” Journal of Interior Design no. 31 (2):10-28. Davies, Bronwyn, and Rom Harré. 1990. Positioning: The discursive production of selves.” Journal for the Theory of Social Behaviour no. 20 (1):43-63. Ford, Robert C., and Duncan R. Dickson. 2012. Enhancing Customer Self – Efficacy in Co-Producing Service Experiences.” Business Horizons no. 55 (2):179-188. Ganoe, Cathy J. 1999. Design as Narrative: A Theory of Inhabiting Interior Space.” Journal of Interior Design no. 25 (2):1-15. Garfinkel, Harold. 1967. Studies in Ethnomethodology. Englewood Cliffs (NJ): Prentice-Hall. Glock, Friedrich. 2009. Aspects of language use in design conversation.” CoDesign no. 5 (1):5-19. Haddon, Leslie. 2003. Domestication and Mobile Telephony.” In Machines That Become Us: The Social Context of Personal Communication Technology, edited by James Everett Katz, 43-56. New Brunswick: Transaction Publishers. Haddon, Leslie. 2007. Roger Silverstone’s Legacies: Domestication.” New Media & Society no. 9 (1):25-32. Haddon, Leslie. 2011. Domestication Analysis, Objects of Study, and the Centrality of Technologies in Everyday Life. Canadian Journal of Communication no. 36 (2):311-323. Hartmann, Maren. 2009. The Changing Urban Landscapes of Media Consumption and Production. European Journal of Communication no. 24 (4): 421-436. Helle-Valle, Jo & Dag Slettemeås. 2008. ICTs, domestication and language-games: a Wittgensteinian approach to media uses. New Media & Society no. 10 (1): 45-66. Heller, Agnes. 1984. Everyday Life. London: Routledge & Kegan Paul. Jokinen, Arja, Kirsi Juhila, and Eero Suoninen. 1999. Diskurssianalyysi liikkeessä [Discourse analysis in movement]. Tampere: Vastapaino. Katz, James E., and Satomi Sugiyama. 2005. Mobile Phones as Fashion Statements: The Co-creation of Mobile Communication’s Public Meaning.” In Mobile Communications: Re-negotiation of the Social Sphere, edited by Richard Seyler Ling and Per E. Pedersen, 63-81. London: Springer. Lie, Merete, and Knut H. Sørensen. 1996. Making Technology Our Own? Domesticating Technology into Everyday Life. Oslo: Scandinavian University Press. Livio, Oren & Weinblatt, Keren Tenenboim. 2007. Discursive Legitimation of Controversial Technology: Ultra-Orthodox Jewish Women in Israel and the Internet. The Communication Review no. 10 (1): 29–56. Luck, Rachael. 2009. Does this compromise your design? Interactionally producing a design concept in talk.” CoDesign no. 5 (1):21-34. Luomanen, Jari. 2010. Living with the media: Analysing talk about information and communication technology. Tampere: Tampere University Press. McDonnell, Janet. 2009. Collaborative negotiation in design: A study of design conversations between architect and building users.” CoDesign no. 5 (1):35-50. McDonnell, Janet. 2011. Accomodating disagreement: A Study of effective design collaboration.” Design Studies no. 33 (1):44-63. Morley, David, and Roger Silverstone. 1990. Domestic Communication: Technologies and Meanings.” Media, Culture & Society no. 12 (1):31-55. Oak, Arlene. 2010. What can talk tell us about design? : Analyzing conversation to understand practice.”. Design Studies no. 32 (3):211-234. Peteri, Virve. 2006. Mediaksi kotiin: Tutkimus teknologioiden kotouttamisesta [Home by Media: A study on Domestication of Media Technologies]. Media studies. Tampere: Tampere University Press. Potter, Jonathan, and Margaret Wetherell. 1987. Discourse and social psychology: beyond attitudes and behaviour. California: Sage Publications. Sanders, Elizabeth B. -N., and Pieter Jan Stappers. 2008. Co-creation and the new landscapes of design.” CoDesign no. 4 (1):5-18. Silverstone, Roger, and Leslie Haddon. 1996. Design and the Domestication of ICTs: Technical Change and Everyday Life.” In Communication by Design. The Politics of Information and Communication Technologies, edited by Roger Silverstone and Robin Mansell, 44-74. Oxford: Oxford University Press. Silverstone, Roger, and Eric Hirsch. 1992. Consuming Technologies: Media and Information in Domestic Spaces. London: Routledge. Silverstone, Roger, Roger Silverstone, Eric Hirsch, and David Morley. 1991. Listening to a Long Conversation: An Ethnographic Approach to the Study of Information and Communication Technologies in the Home.” Cultural Studies no. 5 (2):204. Suoninen, Eero. 1992. Perheen kuvakulmat : diskurssianalyysi perheenäidin puheesta [Perspectives to family: discource analysis of the talk by a mother], Tutkimuksia / Tampereen yliopisto, Sosiologian ja sosiaalipsykologian laitos. A 24. Tampere: Tampereen yliopisto. Tannen, Deborah. 1979. What’s in a Frame? Surface Evidence for Underlying Expectations In New Directions in Discourse Processing, edited by Roy Freedle, 137-181. Norwood: Ablex. expectations.” In Framing in Discourse., edited by Deborah Tannen, 14-56. New York: Oxford University Press.